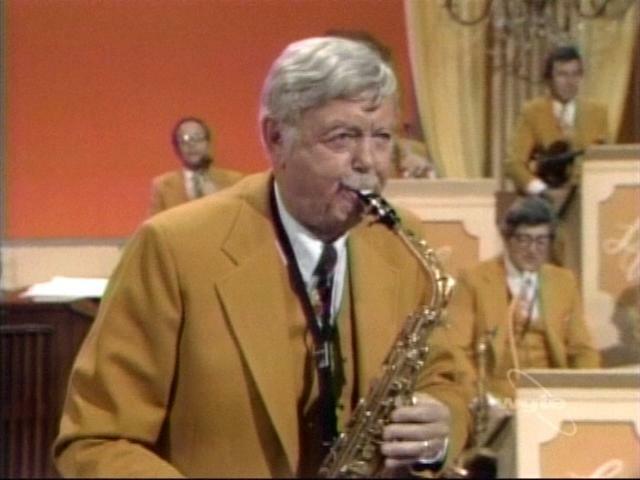 Skeets Herfurt played the saxophone on the Lawrence Welk Show from 1979 to 1982, having already achieved a notable career playing with such musical legends as Tommy Dorsey and Benny Goodman. Herfurt was raised in Denver and played in bands while attending the University of Colorado. During the 1930's, Herfurt worked with Smith Ballew (1934), Jimmy Dorsey and Tommy Dorsey (together 1934-35, Jimmy 1935-37, and Tommy 1937-39), and Ray Noble. After moving to California, he worked with another Welk Show alumni, Alvino Rey, before serving in the Army during 1944-45. Following the end of the war, Herfurt returned to music, as a studio musician in Hollywood in addition to time leading his own band getting the one in a lifetime opportunity to work with the one and only Benny Goodman in 1946-47 and again in 1961 and 1964. Herfurt's other studio credits include recording sessions with Billy May, Louis Armstrong, Georgie Auld, Jack Teagarden, and Stan Kenton. Herfurt. Herfurt also has a couple of film score credits such as his appearance as a saxophonist in the 1958 film The Nightmare, where he also played clarinet on the soundtrack. He is also featured on the soundtrack to the 1974 film The Fortune. In the late 1960's, he played with the Ray Conniff Orchestra, performing in several tours and recording sessions with them. Herfurt died in 1992 at the age of 80.